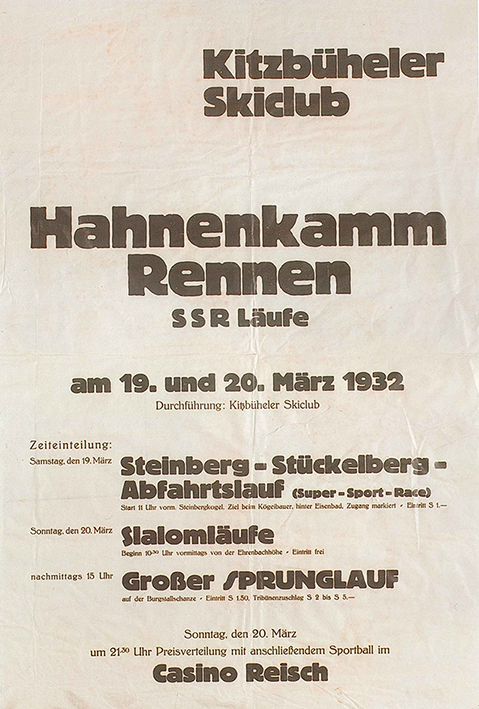 When the Hahnenkamm Races first began in 1931, the tradition for artfully designed posters had not yet been introduced. 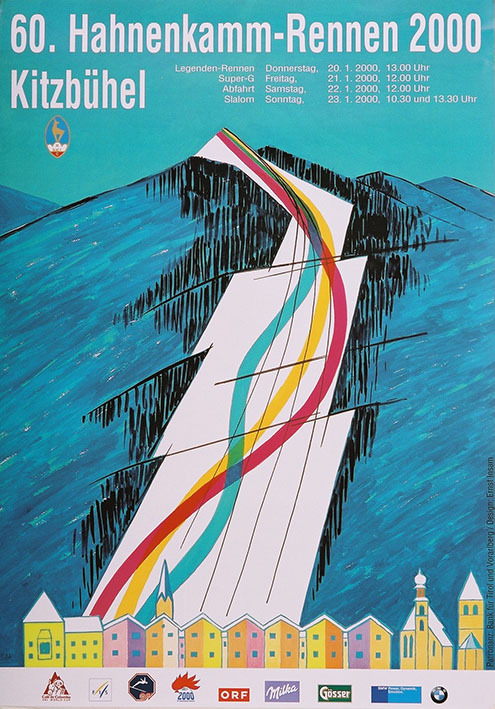 There were only a few motifs designed by the great painter, Alfons Walde, for the very popular ski jumping events of the 1930s. 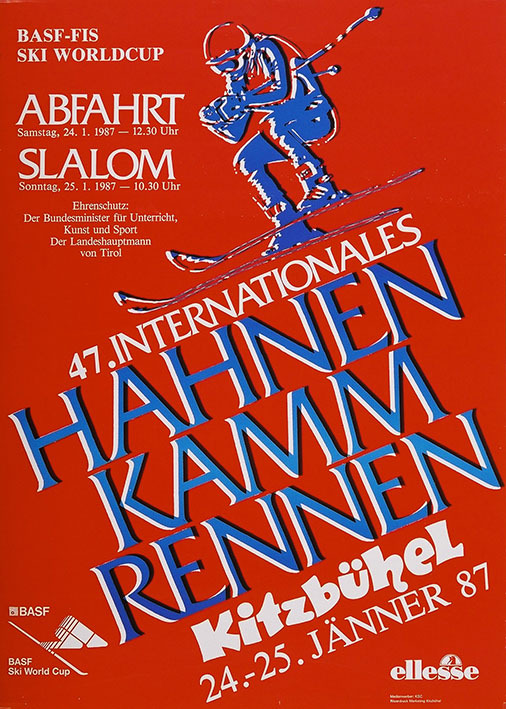 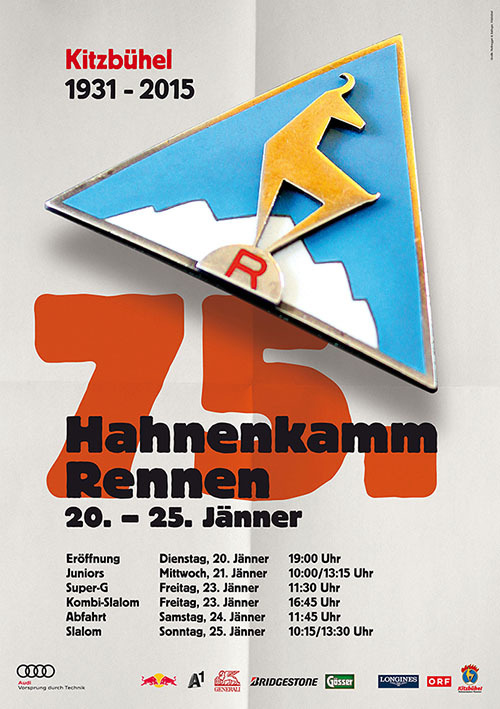 The Hahnenkamm Races were, in fact, promoted exclusively with “text-only posters” right up until the seventies. 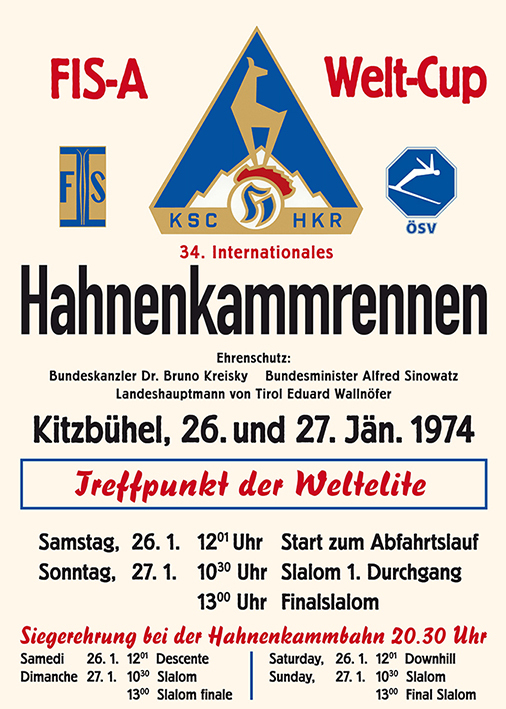 Another graphic poster motif was used from the 70’s until 1987 (red background with a blue ski racer and white text), but it was always the same image. 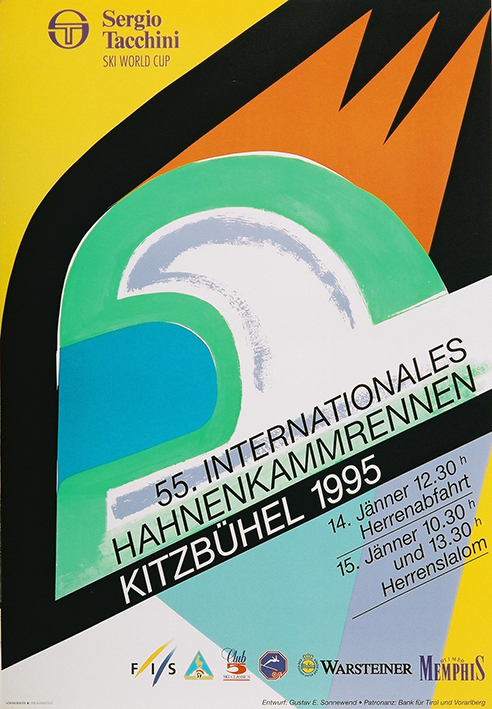 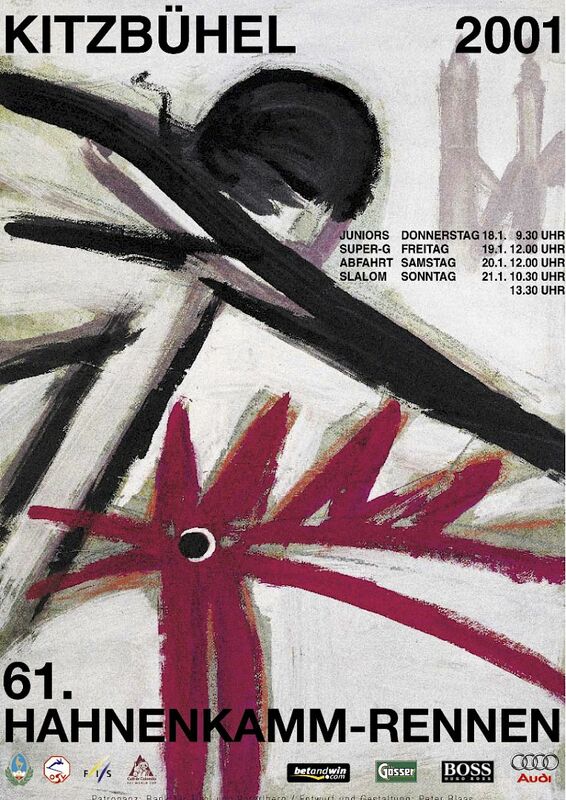 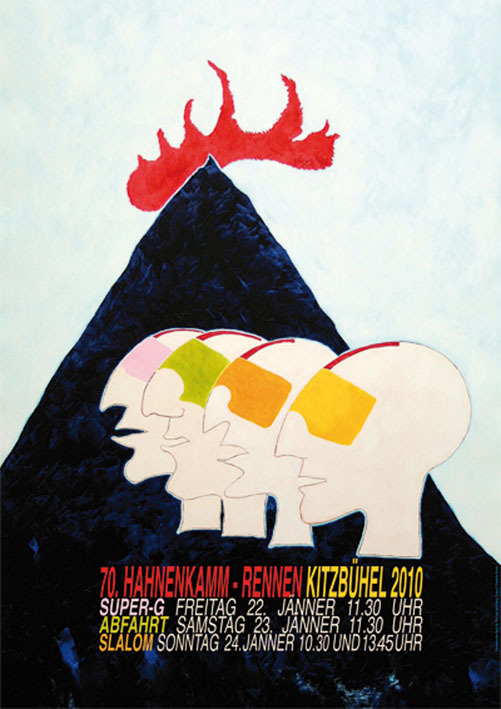 In autumn 1986, a private committee commissioned Kitzbühel artist, Ernst Insam, with the design of an alternative poster for the 1987 races, for which there were two designs. 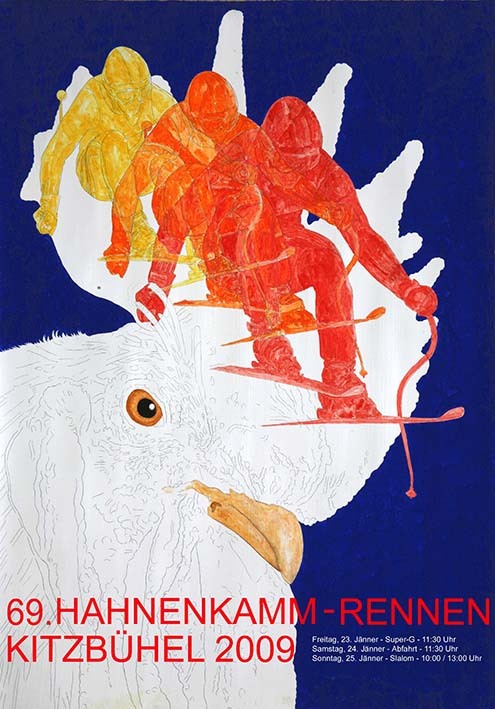 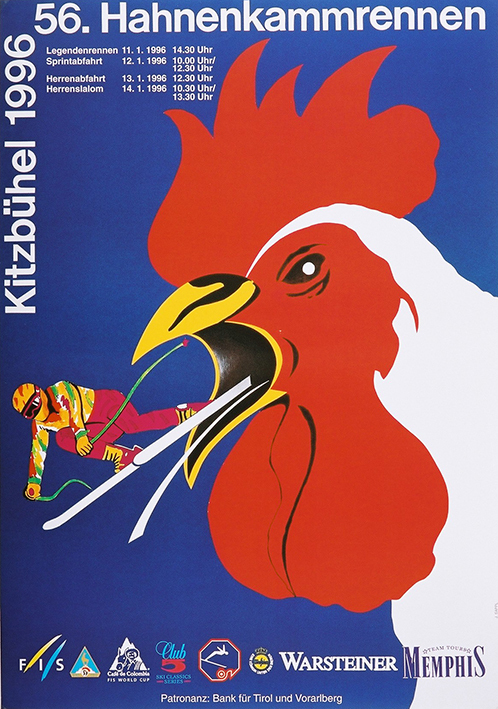 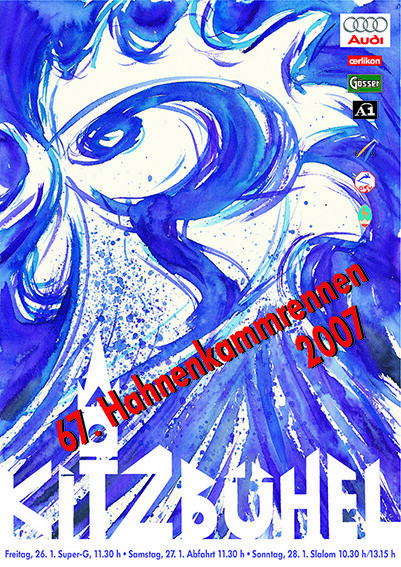 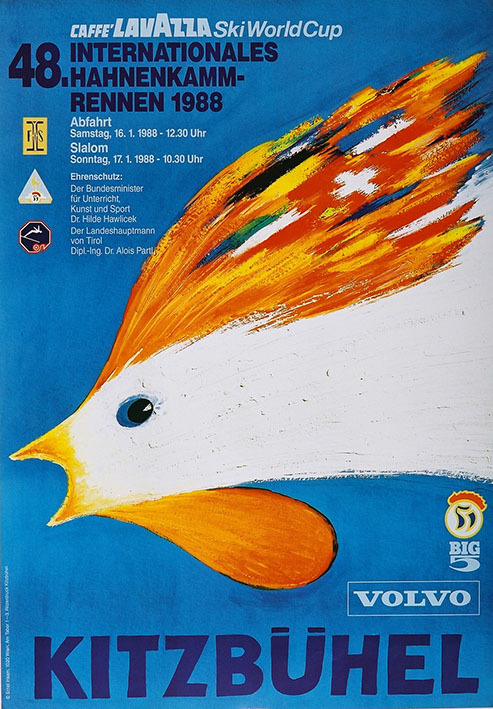 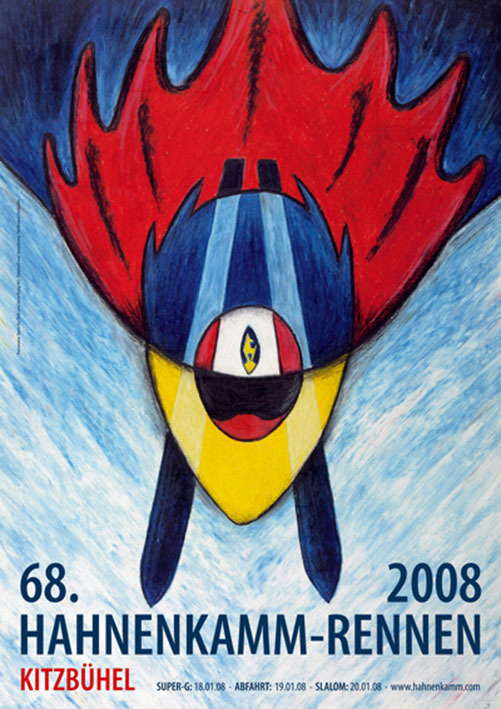 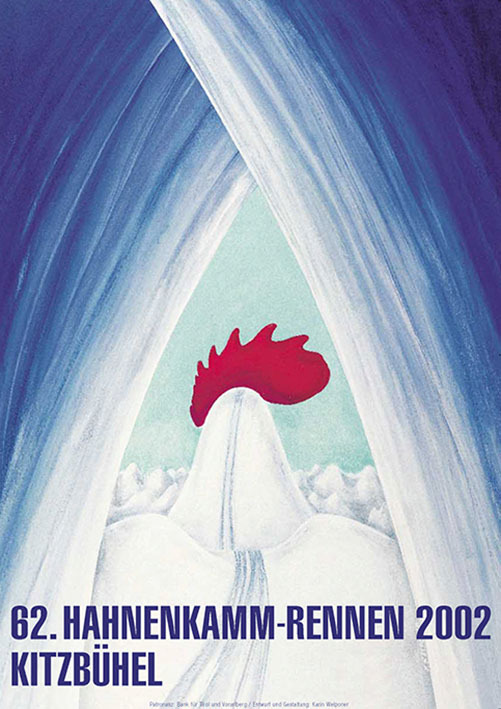 Kitzbühel Ski Club commissioned Ernst Insam directly with the design of the poster for the 1988 and 1989 races, resulting in a modified motif for each race (rooster with feathers of national flags). 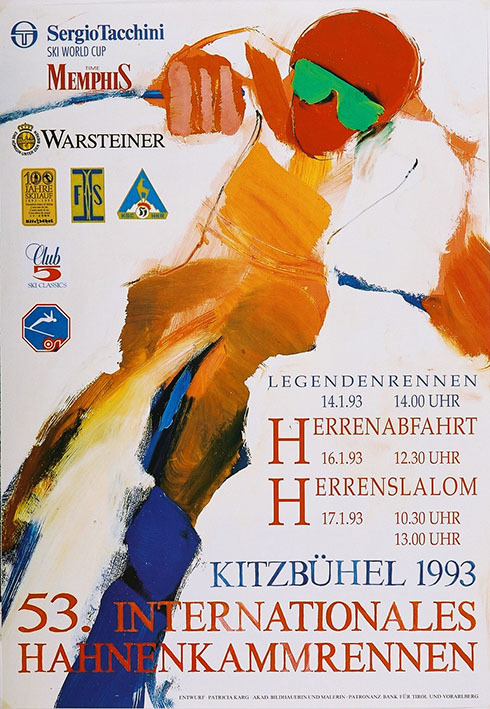 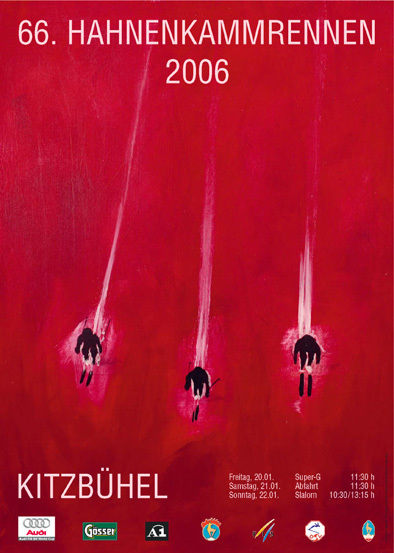 On the occasion of the 50th anniversary Hahnenkamm-Races in 1990, the Kitzbühel branch of BTV (Bank for Tirol und Vorarlberg) offered to organise a tendering procedure, for which a jury would decide the anniversary poster. 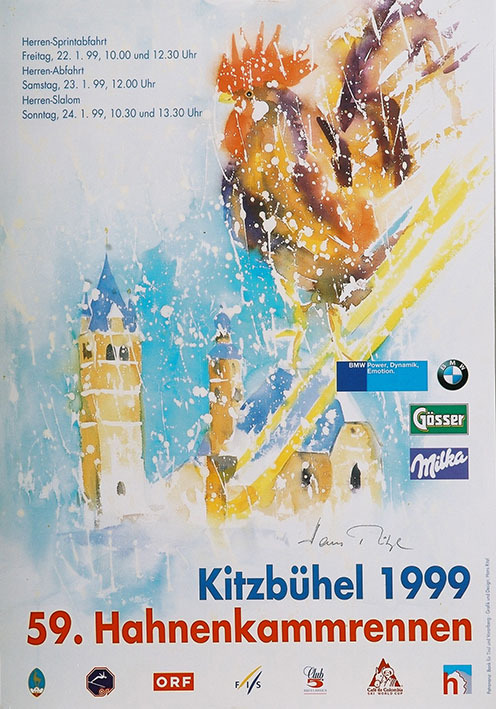 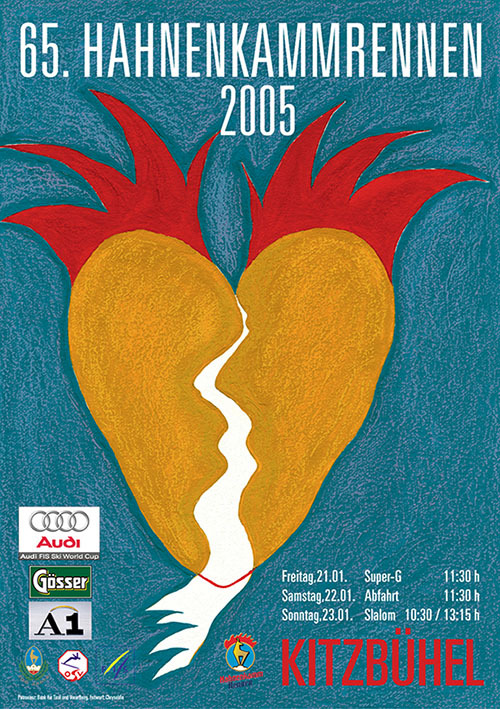 The idea was well received and the Hahnenkamm Races poster design has been selected in this manner ever since. 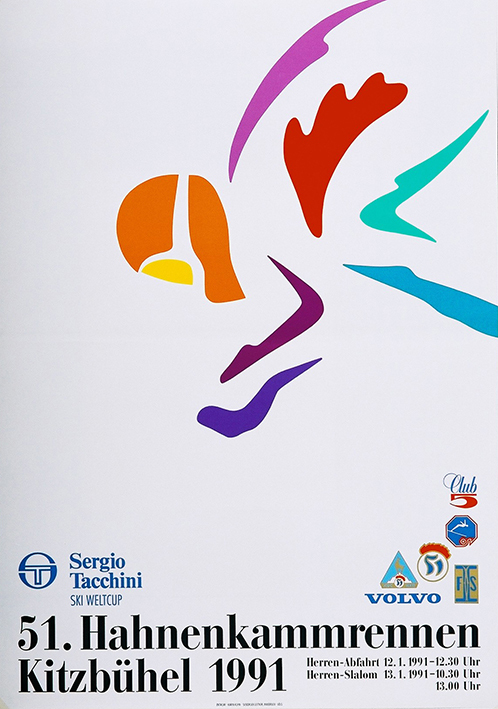 An international competition has been held annually since 2011, which gives the design a different and cosmopolitan perspective. 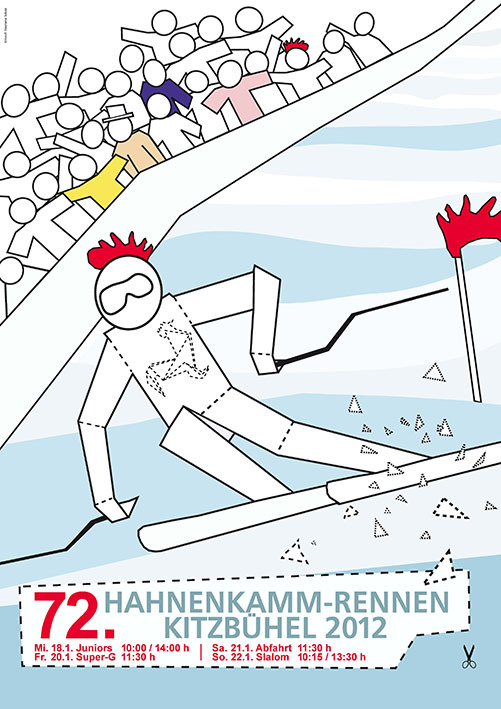 The image theme (originally a ski racer - Hahnenkamm - Kitzbühel town) has also been given more scope. 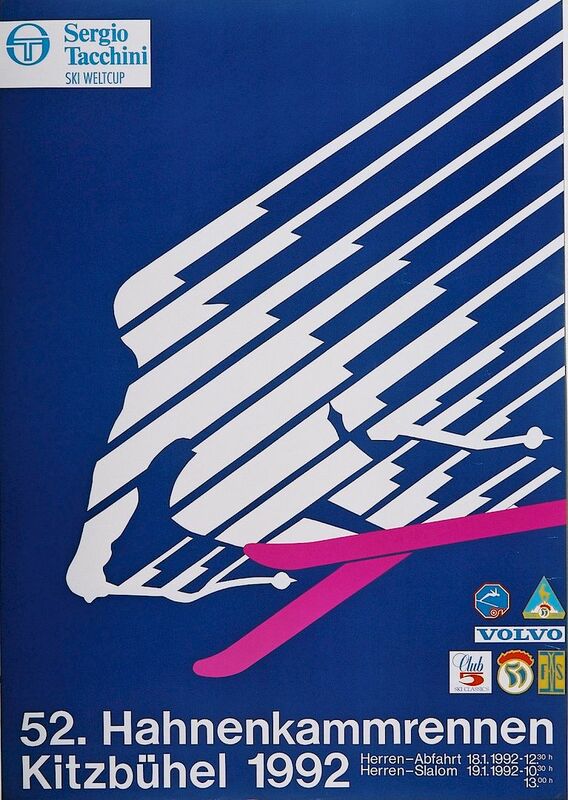 Commissioned work, for example by graphic designers and agencies, is not the focal point here. 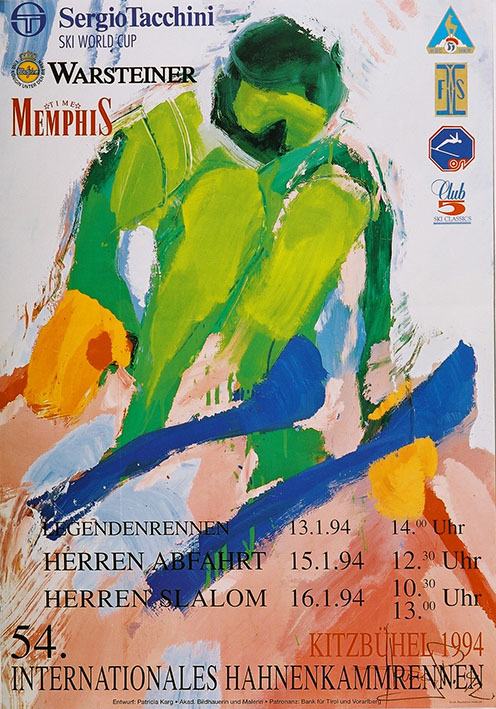 The art posters for the Hahnenkamm Races are registered at the Olympic Museum in Lausanne and are highly sought-after by collectors worldwide. 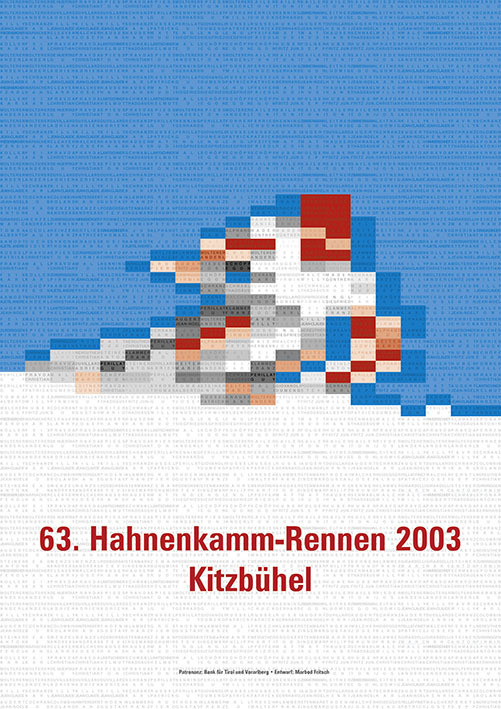 The latest FIS Ski Book (Ski Sport in Art and Design by Karin Rade, Leipzig edition) also features two poster designs from the Hahnenkamm Races. 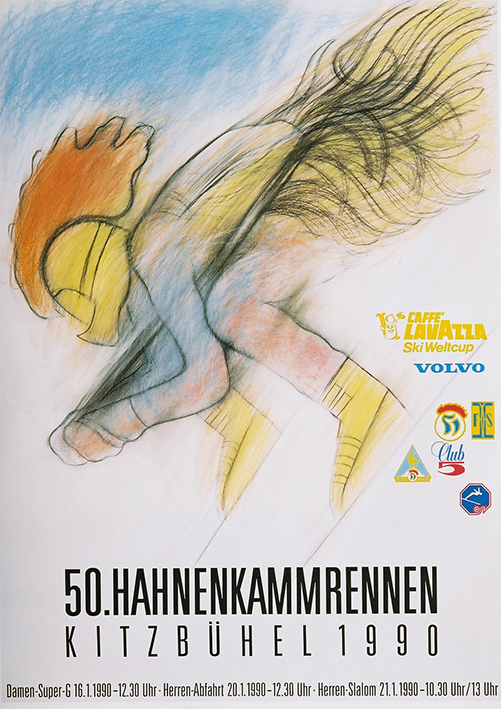 Proceeds generated by poster sales are donated to the support of Kitzbühel’s young and up-coming ski talent. 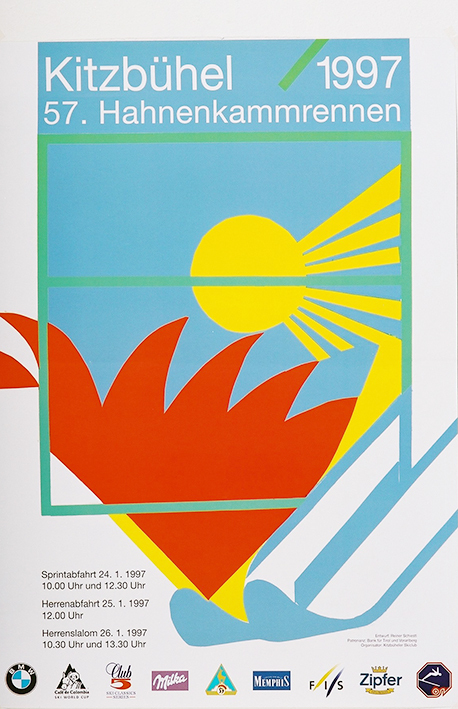 The posters are produced in A1 format (59.4 x 84.1 cm) and printed on high quality paper stock. 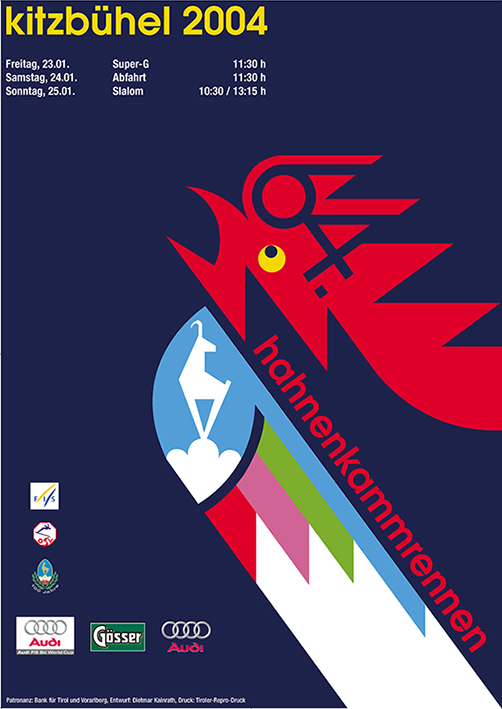 DESIGN THE POSTER 2019 - International Poster Contest ! 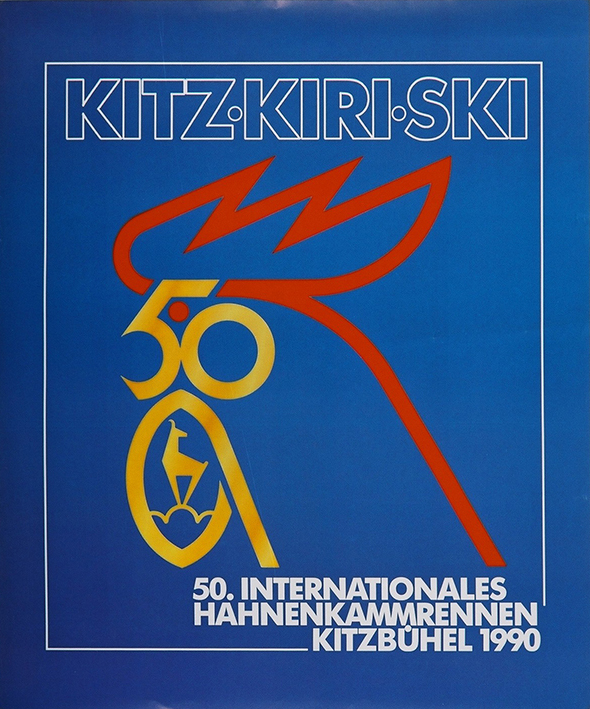 As organizers of the Hahnenkamm‐Race, the Kitzbühel Ski Club (K.S.C.) 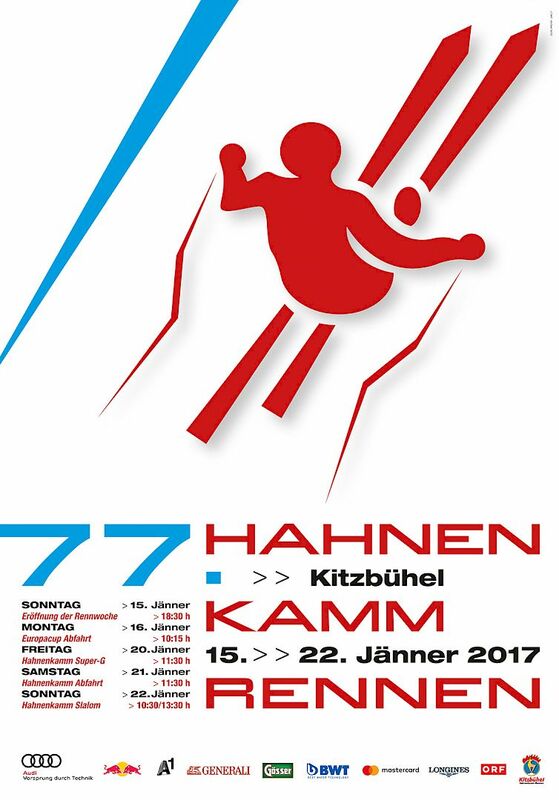 hereby invites all interested parties to participate in the competition to design the Hahnenkamm‐Race 2019 poster. 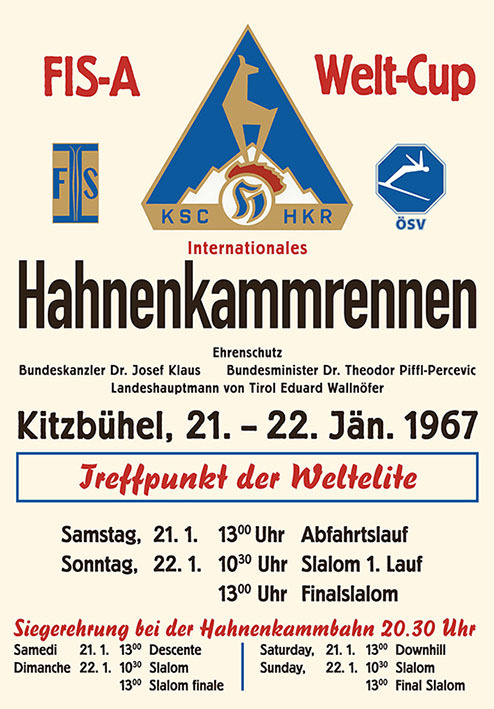 The K.S.C. 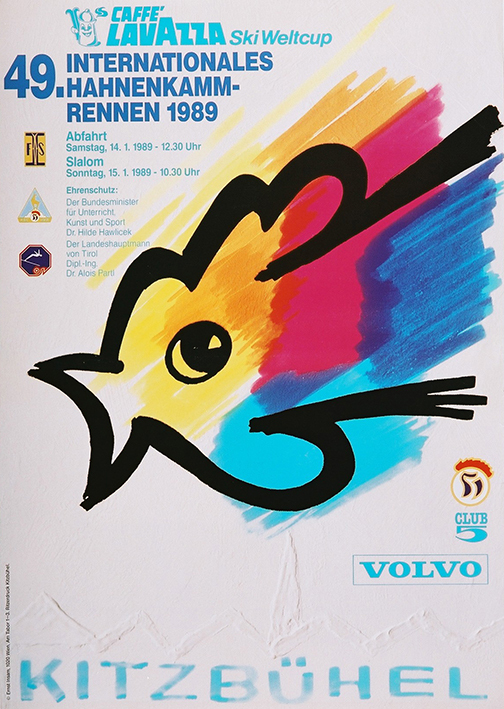 would like to continue their annual tradition, which started in 1987, of the official poster being designed by independent artists. 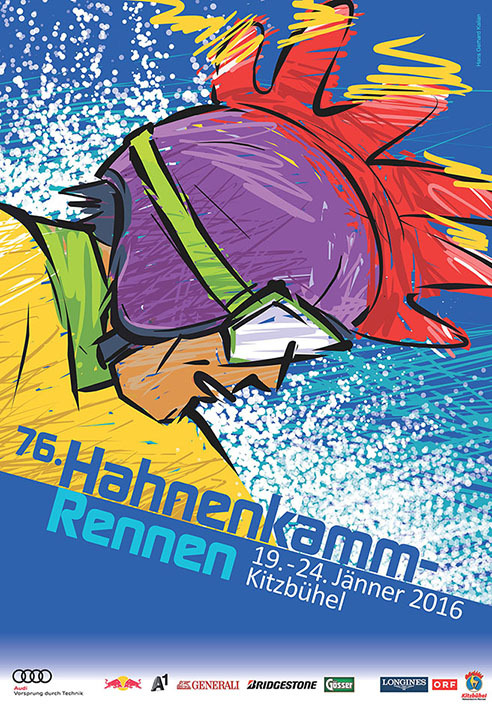 This new type of open and international invitation to participate is intended to emphasize the reputation of this event as an „International Sport Festival“. 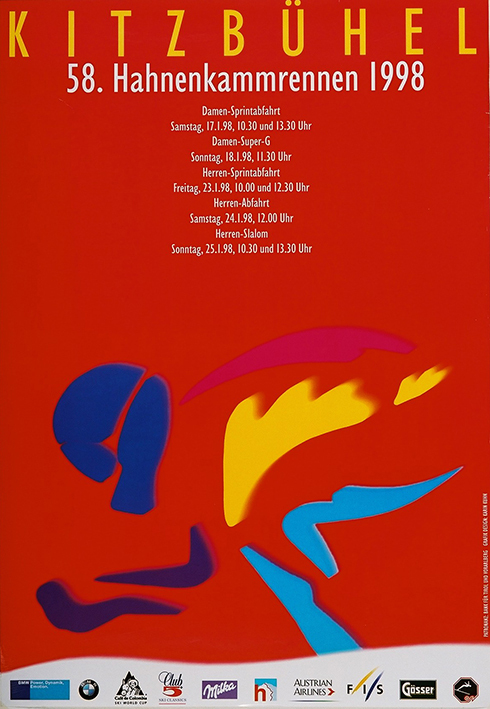 The poster image itself is used to market the event on advertisements and other printed materials, such as tickets, merchandise and official web site etc. 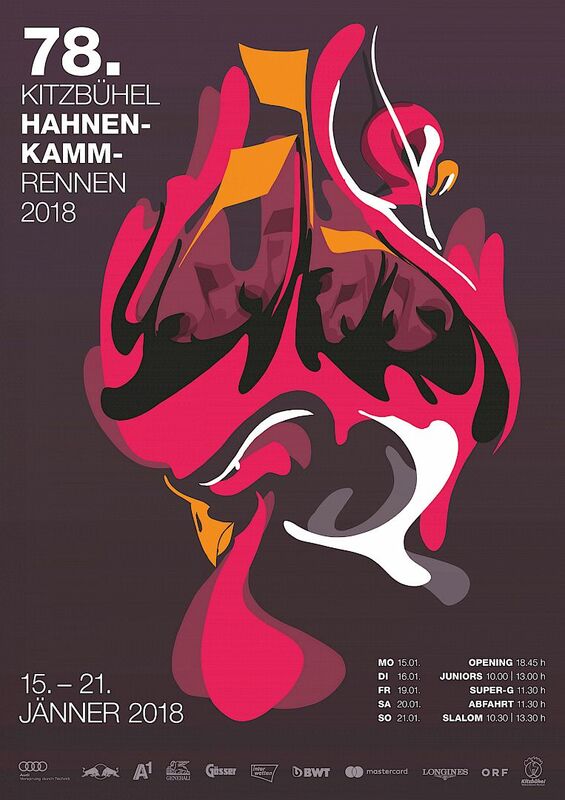 Entry submission is only possible in digital form and the winner will be decided by the end of June 2018. 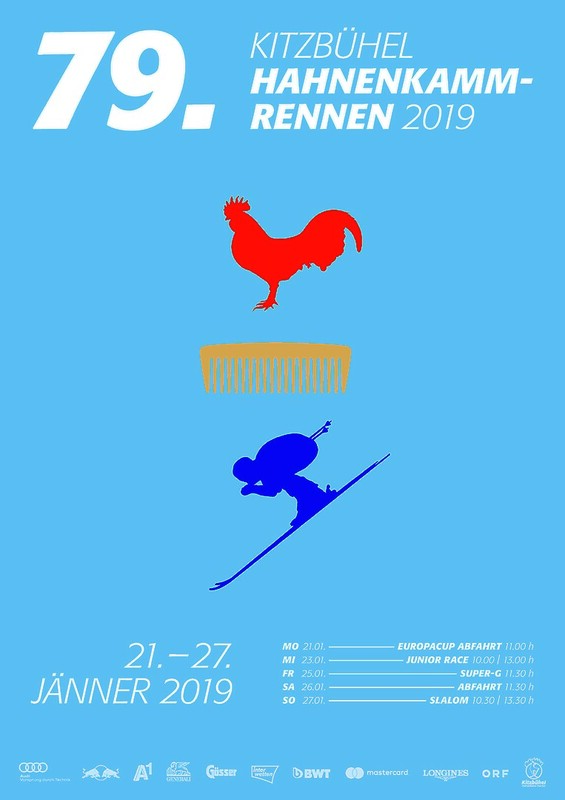 Further details can be found on the Conditions of Tender, Poster 2019. 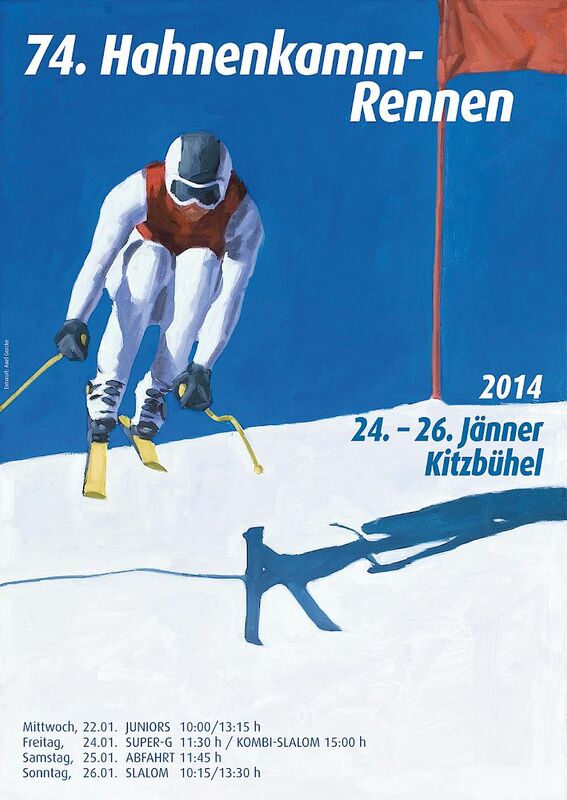 The Kitzbühel Ski Club is looking forward to receiving numerous entries. 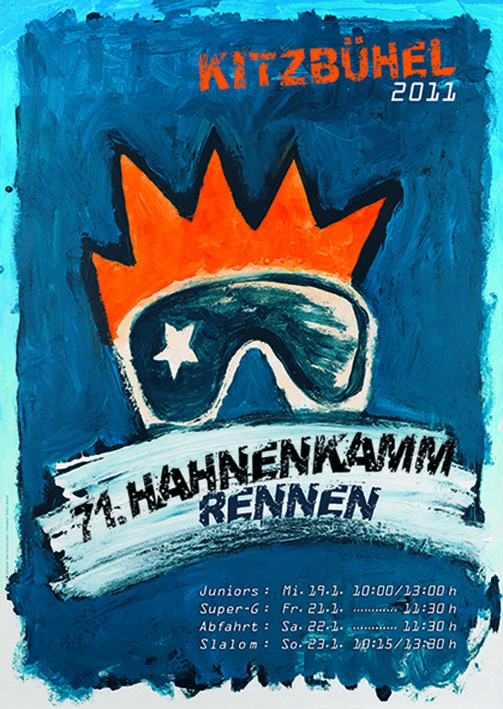 1 1987 KSC Grafik/Druckerei Grafik "rotes Plakat"
26 2011 KSC Johannes Maria Braun Innsbruck Acryl Sieger, Star, "King of the Race"
30 2015 KSC Peter Salinger Kitzbühel Grafik Retro "75. 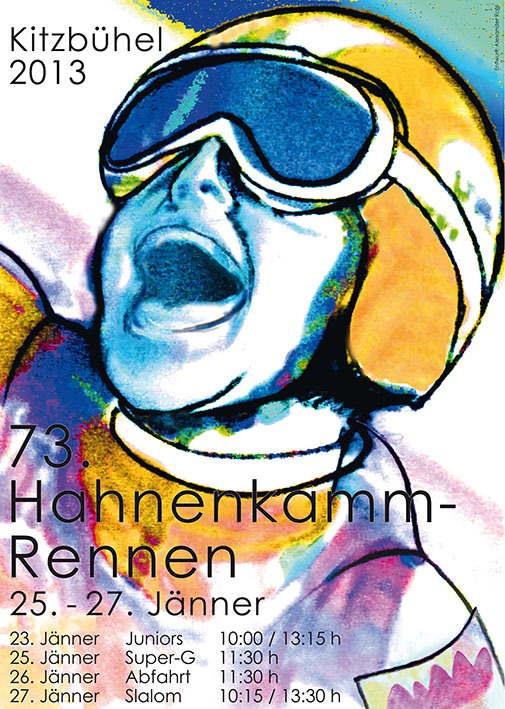 Hahnenkamm-Rennen"
Calling all collectors: a small number of posters from previous years are still available – although unfortunately not from every year.